Grand Inquisitor is a rare Willpower creature card. It is part of the Houses of Morrowind expansion. "You will regret your heresies." "I bring the Tribunal's justice!" This card's exalt ability applies the Questioner card effect. 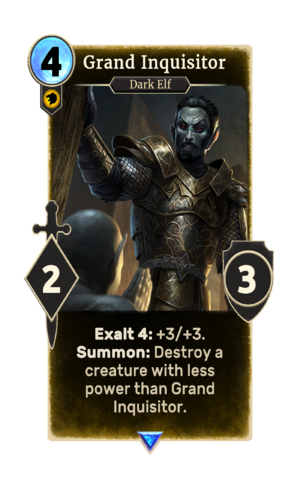 This card depicts the Grand Inquisitor, who first appeared in Morrowind.